Do incinerators produce green energy? NO! Incinerators produce dangerous toxic emissions and greenhouse gases. Incinerators produce about 1 tonne of CO2 for every tonne of rubbish burned. Waste incinerators are a very inefficient way to produce energy due to the variable feedstock – one moment it will be plastic and the next wet food waste. Incinerators can only do one thing and that is burn waste which makes them a disincentive to waste reduction. Viridor have admitted that no heat will be supplied to anyone at least for the first several years of operation, which means it will NOT be a combined heat and power plant as agreed. However, planning permission was given knowing this fact. To find out more about why the waste heat won’t every be used read this article. 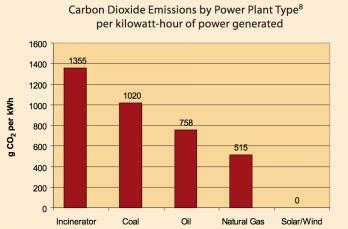 ← Do incinerators produce green energy?